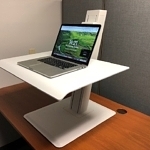 The latest addition to Humanscale's QuickStand series of converters, the Eco is yet another example of great-looking design meets ergonomic insufficiency. 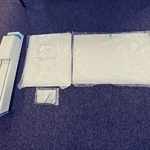 The tray is too wobbly to type comfortably on, and the monitors are not independently adjustable relative to the work surface (without a great deal of hassle). 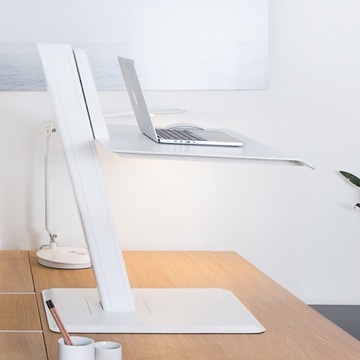 It may work as a laptop stand for short work sessions, but in general this product is a lot nicer to look at than it is to use. Maximum monitor weight: 30 lbs. Vertical monitor adjustment range: 5.5"
Total height adjustment range: 18.6"
An ultra-clean design combined with high-quality components give the Eco an overall premium look and feel. The wobbly work surface is basically a deal-breaker. It's not stable enough to be used as a typing surface for any extended length of time. 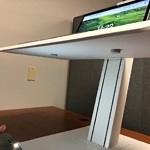 Additionally, the monitor mount height is not easily adjustable relative to the platform height, which will cause ergonomic problems for anyone looking to switch between sitting and standing regularly. The Eco is a beautifully designed converter that fails in a few fundamental ways. The first is that the tray is incredibly wobbly and will shake when you type on it, even if you're not a heavy typist. 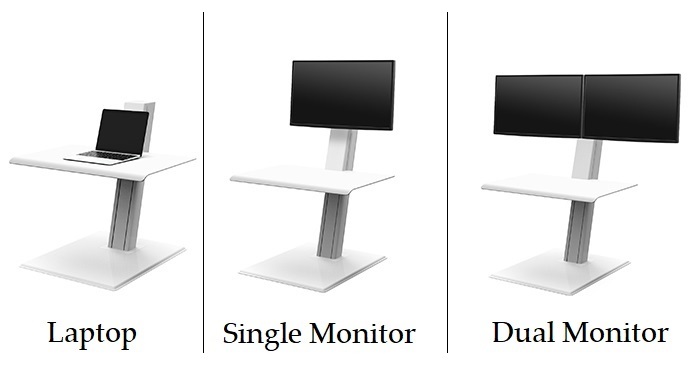 The second is that the monitor mounting height is not independently adjustable on the fly, which is ergonomically insufficient for a sit-to-stand workstation. Its good looks and quality construction fail to make up for its shortcomings, making the Eco a tough product to recommend. 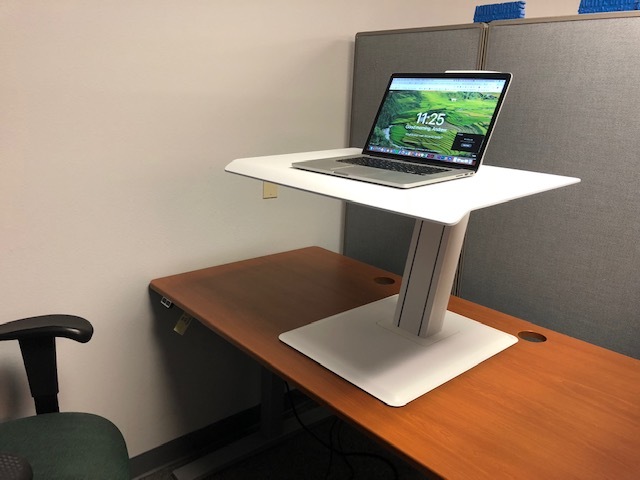 Humanscale is a long-time manufacturer of chairs, ergonomic keyboard trays, monitor arms and, as of the past few years, standing desks and desktop converters. They are known for their top-of-the-line industrial design, blending into the most elegant offices with the highest investment in fine décor. As such they tend to score highest in the looks department, but not necessarily in the ergonomics department. 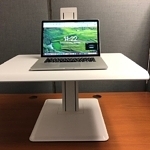 When it comes to standing desk converters Humanscale has had a mixed past. Their lead-in product in this category was the QuickStand Workstation, one of the pricier units on the market. The product has been haunted not just by its premium price point but its lack of stability while typing, and industry rumor has it, a patent violation lawsuit from competitor Ergotron. 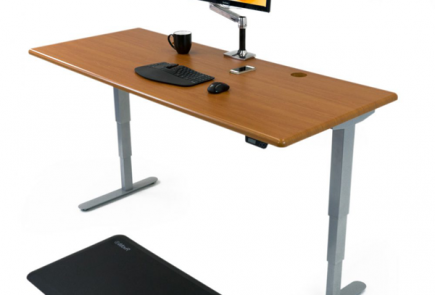 The QuickStand Workstation was soon followed by the QuickStand Lite, an entirely different sort of standing desk converter (a hovering unit versus a post-and-base design). 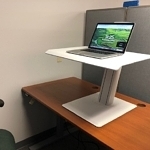 While you can’t knock Humanscale for a lack of design innovation, they’re a follower, not a leader in this category, and the QuickStand Lite was an ill-fated attempt to address the lofty price point of the QuickStand. 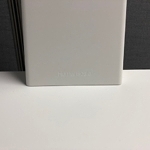 Unfortunately it is not the most price-competitive unit its subcategory of hovering desktop converters, and suffers from significant stability issues as well. Enter the Humanscale Eco – Will the Third Time be the Charm? Humanscale is nothing if not sensitive to market feedback. 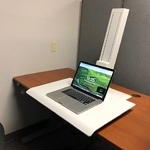 They heard from many customers that they wanted something better than Varidesk but also affordable and reliable. True to the brand the Eco is a looker—there’s no such thing as a Humanscale product that isn’t—but does it conquer the stability issues of the past and is it a good value at the end of the day? That’s what our expert review staff set out to test. 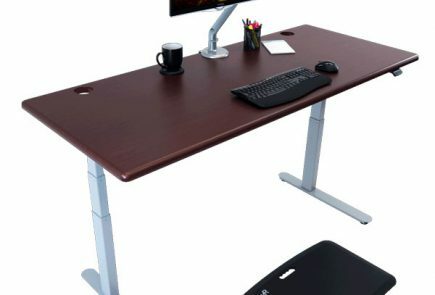 After all the hype from the Humanscale representatives about the new Eco we were anxious to see how it really stacks up to the 70+ other standing desk converters on the market today, most of which we’ve reviewed over the years on our comprehensive round-up of Standing Desk Converter Reviews. 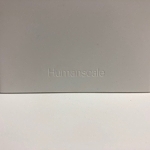 Knowing the product is from Humanscale we weren’t expecting something cheap and flimsy like you can find on Amazon for a couple of hundred bucks. Indeed the build quality on the Eco is extraordinary, and classic Humanscale. But how does the ergonomic design stand up? With the Eco, once again, the product design team appears to have been driven by ID (industrial design) and not by ergonomics. Quality of materials is always at odds with consumer value, but when you add a lot of molded and tooled parts, the cost will naturally go up as well. Given that the product was named “Eco” (short for “economy) and it has a Humanscale label on the box, it’s going to be an eternal challenge for the company to respect its brand and make something truly affordable at the same time. Despite being made in China and Mexico, the quality of the unit’s materials and precision machining are unimpeachable. Bottom line: true to the company’s reputation the Eco looks fantastic and is well built, but you can check ergonomic design and consumer value at the door. The Eco comes configured either for a laptop-only setup or for a laptop/desktop with remote monitor and keyboard. 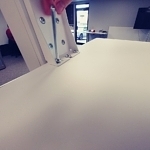 The difference is whether the sliding post has just the work surface attached or also a VESA mount for your LCD monitor. A third “dual bar” version is also available for dual monitor use. The work surface on the Eco is styled slightly differently than the QuickStand, with a “pillowtop” curve along the user edge in place of the padded wrist rest on its more deluxe cousin. Alas the entire work surface is made of the same flexible material as the one on the QuickStand, which appears to be some sort of phenolic or resin. This results in a shaky typing experience, especially if you’re prone to pounding hard on your keyboard. The shaking will not transmit to your monitor, thankfully, given all the heavy steal in the post, but it will likely generate more errors when you type. Another annoying aspect of the work surface design is that it doesn’t come all the way down to the desk surface in the sitting position, so it’s going to raise your typing surface by about an inch. 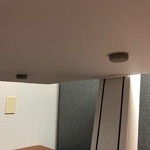 We found we needed to put foam spacers underneath the work surface to stop the shaking when using it in the seated position. The shakiness at standing height can’t be helped. 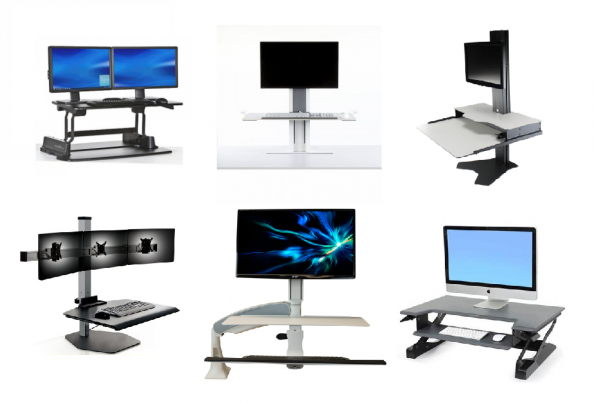 Unless you only stand at your desk for very short periods of time you’re going to want to adjust your monitor(s) upwards, relative to your work surface or keyboard height, every time you switch from sitting to standing. This is because our torsos grow taller when we stand, taking the 90-degree bend out of the bottom of the spine when seated. So this is something you can anticipate doing each and every time you switch positions, which for most people is two to four times a day. 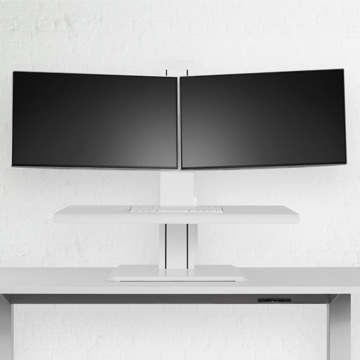 And this is where the Humanscale Eco not only fails to impress, it’s a deal killer if you’re using a mounted monitor, in our opinion. 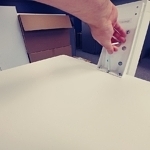 While Humanscale claims it has an independently adjustable monitor height, what they mean is you can set the height once when you assemble the unit, and if you ever want to change it again you’ll need to get the toolbox out and remove your monitors, then disassemble and reassemble the VESA mount at a different height setting. So this is not something you’re going to do several times a day. Even for the initial install you may find yourself having to change this height setting once or twice before it feels right to you, which is already exasperating. It gets worse. The height adjustment range on the monitor mount during installation is limited to only 5” of vertical range. 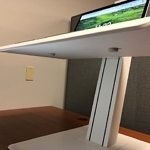 Combined with the fact that the work surface rests an inch too high above the desk already, some people may find that if they set their monitor height correctly for standing, when they sit they’ll have their arms raised too high and neck tilted back to look up at the monitor—a really bad combination ergonomically speaking. 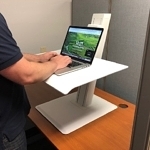 For the same money as an Eco you could get any number of Z-Lift or X-Lift standing desk converters with an ergonomically-adjustable monitor arm, and make your entire sit-stand adjustment—desk surface height as well as monitor height—in seconds. 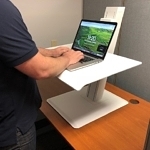 If you’d like to avoid trading in the standing benefit for a neck strain problem you’ll want to steer towards a standing desk converter with true independent monitor height adjustment, not the Eco. 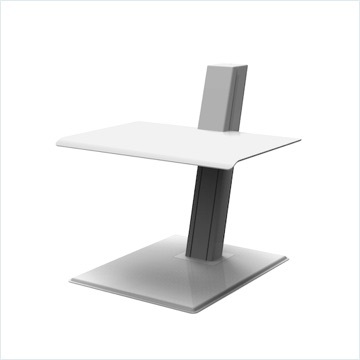 The Humanscale QuickStand Eco at its lowest height range. 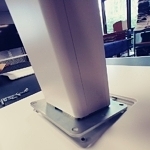 All versions of the QuickStand Eco have a robust counterbalance mechanism inside the post. The counterbalance setting is made by turning a screw on the top of the column (tool required) until the upward force is equal to the downward force. Once it is properly set, you will be able to raise and lower the height of the platform without having to use a lever or locking system. The advantage of this is obvious, but the disadvantage is that adding or removing weight to the work surface will cause the entire work surface to start jogging upwards or downwards as you type. 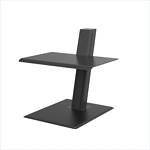 Cable management is elegantly handled inside the post, as with the Humanscale QuickStand model. The Eco’s best purpose is for someone who only uses a laptop while standing, and not for very long periods of time. 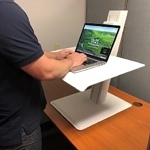 It’s classy, stylish, ultra-durable and will look great in any office, but its ergonomics leave a bit to be desired, particularly at this price point. The Eco’s lack of an independent height adjustment for the monitor leaves it far short of ergonomically acceptable for any kind of extended time use.